Select a competitor product from the drop down list below and we will suggest the most cost effective Epson WorkForce Pro model for your needs. You can change products and compare specifications and total cost of ownership on the results page. 2. How many pages do you print per month? 3. What percentage of pages do you print in colour? 4. How long on average do you use a printer? The Calculator indicates the overall costs of ownership based on purchase costs of hardware plus the ongoing costs of ink or toner. Please note that additional variable costs may influence the costs, including but not limited to servicing, power consumption and part replacement. The Calculator relates only to comparisons made with the Epson WorkForce Pro C5xx0/6000/C8xx0 Series and is not intended as a general product comparison tool for other Epson printers. The WorkForce Pro Series is designed for the business market and therefore usages and figures are in line with typical business use. The Calculator is not designed to be used by retail consumers for domestic purposes. The Calculator is not designed to replace information that may be provided by your dealer or in the detailed specifications that come with any product. The Calculator is designed as a guide only. 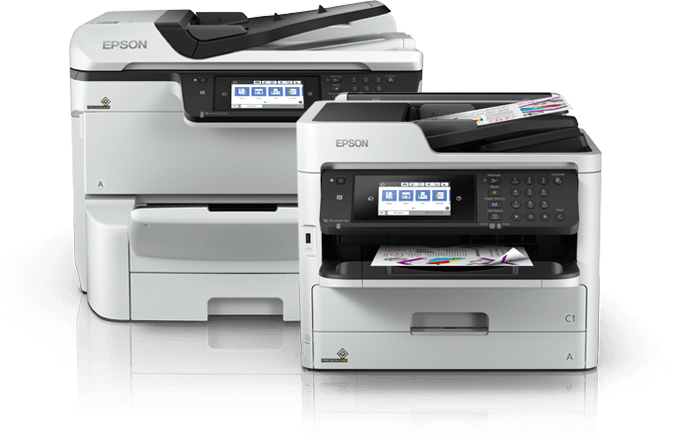 Although Epson have used reasonable endeavours to ensure the accuracy of the data on this site at the time of publication, no representations or warranties are made as to accuracy or currency of the data. Potential customers should take steps to verify the accuracy of important data which materially affects their business and should not seek to rely on the figures provided here. Epson hardware and consumables pricing is based on current RRPs of products and does not take into consideration any special discounts, promotions or bundles deals that may be available. VAT and delivery charges are not included in the pricing calculations. An average street price for competitors' laser printer hardware and consumables cost is obtained from GAP Intelligence (who are one of the leading independent providers of IT data and competitor information analysis in the IT hardware sector), based on data from the UK, France and Germany. VAT and delivery charges are not included in the pricing calculations. All pricing is correct at time of publishing - May 2018. Prices are subject to change due to market conditions. Printing costs are based on use of the default settings being used on both the WorkForce and laser Printers. This is consistent with the settings employed in ISO certification. All costs are based on highest yield original hardware manufacturers' consumables. Average Colour CPP is calculated from the consumables cost divided by the ISO yields officially disclosed in public available information. Average Mono CPP is calculated from the Cost of the black consumables divided by the approximated ISO yield of the black consumables officially disclosed in public available information. For the purpose of fair comparison and accurate data reporting, yield data is taken from the highest yield consumables available at the time of publication which has been determined according to ISO standards. This data is publicly available. All competitors' manufacturer specifications and performance data have been collated from publicly available information including but not limited to manufacturers' own brochures and websites. [Average colour CPP x colour print volume] plus [Average mono CPP x mono print volume] plus cost of the hardware. British Pound to Euro exchange rate is set according to Bank of England and is updated monthly on the 1st day of each month.